Thank you for your interest in booking a free demonstration. Please provide your contact details using the form below including the date you would like your demonstration. Please include a short message detailing which vehicle you are interested in and any specifications/requirements you may have. We will contact you very soon to confirm your demonstration. 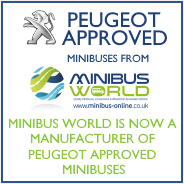 If you have any isssues using our demonstration booking form please call 01782 444289 or email sales@minibus-online.co.uk.